LOS ANGELES, Aug. 9, 2018 -- To promote their new high-end EV brand invested by SITECH, GYON held a launch press conference and signing ceremony to officially release the brand and announce its concept car design in collaboration with Gaffoglio Family Metalcrafters, Inc. (GFMI) on August 8th, 2018. The co-founder and president of GYON, Joe Chao, former global president and CEO at Chrysler, Tom Lasorda, and the executive team of GYON appeared at the ceremony. The slogan of GYON is "Right Is Our Niche," which promotes the fact that the brand is looking for new opportunities in China's newly high-end automobile market. "We want our customers to feel happy and satisfied," said Joe. As a new energy automotive OEM, GYON offers a portfolio of smart EV passenger cars that deliver reliable performance, top-quality, customer-driven features, hi-tech connectivity, chic design, five-star safety, and hassle-free experience. The design of the new concept car will be provided by GFMI, a worldwide well-known product developer that has developed many outstanding concept automobiles. 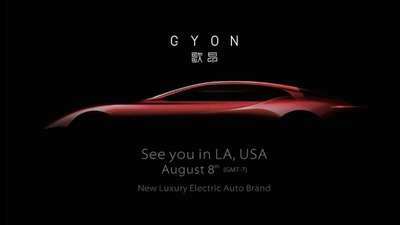 GYON's first newly high-end concept car will be launched in 2019. GYON's products will cover three mainstream market segments: sedan, SUV, and crossover. GYON is developing a GYON Operating System (G-OS), which is an approach that uses data-based logic to mimic human cognitive capability. Also, GYON's EV vehicle has fantastic new hardware. The battery pack can be charged to 80% within 10 minutes, as well as fully charged in 15 minutes, and it also can support 360-372 miles of driving. With the full support and strategic cooperation of the Chengdu government, GYON will settle in Chengdu. The dream of GYON is to orchestrate an automotive ecosystem that brings direct benefits to the urban masses and helps stimulate the economic growth of the city. As a new breed of Chinese avant-garde OEM, GYON is planning to introduce nine models in the next 8 years to the Chinese market to emerge. The goal of GYON is to sell more than 400,000 vehicles to the markets.